Grosset & Dunlap, 9781524785963, 14pp. 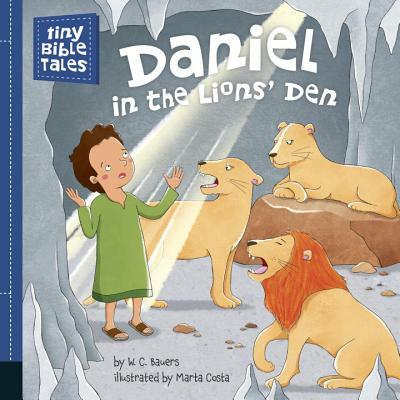 Tiny Bible Tales, a series of board books, shares the stories of the Bible's bravest heroes with gentle, rhyming text and gorgeous illustrations. When Daniel is thrown into the lion's den, it will take all of his prayer and faith to save him. This board book combines quiet, rhyming text with simple and colorful art to tell one of the Bible's most treasured stories. Marta Costa was born in Barcelona and studied graphic design in the ELISAVA School of Barcelona. In 2005, she started her own company for design, serigraphy, and the commercialization of T-shirts and other products for children. Since 2007, she has worked as a freelance illustrator, working mostly for publishing companies in Spain. Most recently, she has illustrated Noah's Ark for Penguin Young Readers.